BANGKOK, Jan 17 – Two major rivals for the Thai capital’s gubernatorial election braced today’s heat on their campaign trails in the capital, each offering palettes of promises for a better life for people in the City of Angels. Ex-Bangkok governor and Democrat hopeful Sukhumbhand Paribatra announced that Bangkok will be safer with 20,000 more closed-circuit television (CCTV) cameras and brighter at nighttime with 17,000 additional lights. Volunteers will patrol beginning at dusk in crime-prone areas, he said, adding that an agreement is being made with the army to train volunteers, and that 700 army reservists will be posted to watch for drug abuse in 200 communities city-wide. Some Democrat executives including campaign manager Ong-art Klampaiboon and former Metropolitan police commander Vichai Sangprapai joined Mr Sukhumbhand in the campaign in the Klong Toey area. Pheu Thai candidate Pongsapat Pongcharoen began his second day of political activity in Chinatown, starting at the sacred Chinese temple of Mangkorn Kamalawas. His walking route covered the nearby Chao Phraya River including Ratchawong pier – one of the city’s oldest landing sites where Chinese migrants came ashore in the old days, arriving from the Middle Kingdom to the north. He said the 17km promenande along the river from the Rama VIII to the Sathorn bridges will be re-paved for people’s leisure activity and strolling. He added that the Habour Department will be asked through the central government to reduce service boat fares to relieve commuters’ financial burden while the defunct tram service in Rattanakosin (‘Old Town’) area will be restored. The tram will run from Rattanakosin Island to Chinatown to ease traffic congestion and attract tourists, he said. 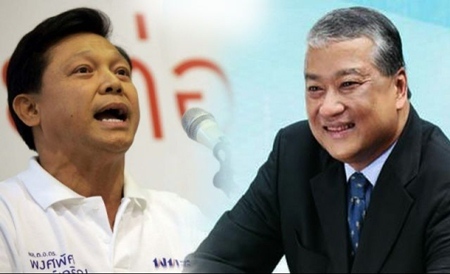 Asked how he will adjust his campaign strategy given that he is trailing his rival in four inner Bangkok districts as revealed by a poll, the ex-deputy national police chief said to win or lose is not the point since he is not a professional politician. “I only want to volunteer to work as an offspring of Bangkok people. I believe my policy will win over voters,” he said.